After spending a week in Florianópolis, I boarded a Caterinense bus and headed north through the verdant, mountainous landscapes and Germanic towns of Santa Catarina and into the state of Parana. My destination: the city of Curitiba. Most gringoes have probably never heard of Curitiba, a major city in southern Brazil, the capital city of the state of Paraná and home to nearly 1.8 million people, making it the eighth largest in the country. It is situated over 3,000 feet (900 meters) above sea level, keeping it relatively cool in the hot summer months. Its name means “pine nut land” in Tupi-Guarani and the city is sprinkled with the distinctive looking Araucaria angustifolia, also known as the Paraná pine or candelabra tree. 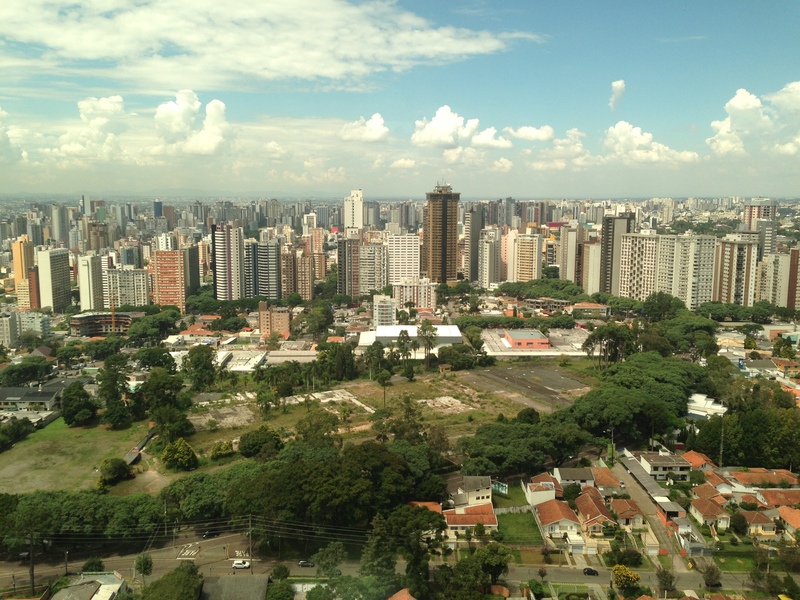 Outnumbering pine trees within Curitiba is a dense forest of high-rise apartments and office buildings. Curitiba definitely gives you a big city feel, but it is certainly not quite as intimidating as São Paulo or Rio de Janiero. The city has a very high Human Development Index, a relatively low crime rate for a Brazilian city and good quality of life. It has been selected as a host city for the FIFA 2014 World Cup. Founded by the Portuguese in 1693, Curitiba was mostly a mining town for its first one hundred fifty years. After 1850, the city saw waves of immigration from Germany, Italy, Poland, Russia, and Ukraine. In 1853, the state of Paraná was carved out of the state of Sao Paulo and Curitiba became the new state’s capital. In the late nineteenth century, Curitiba was an important cattle trading town and chimarrão drinking tropeiros. The city grew on the wealth from cultivation of the maté plant and the lumber industry. Years later, coffee became the most important crop in the region. Curitiba’s population boomed significantly after 1950 and the city became one of the wealthiest cities in Brazil. 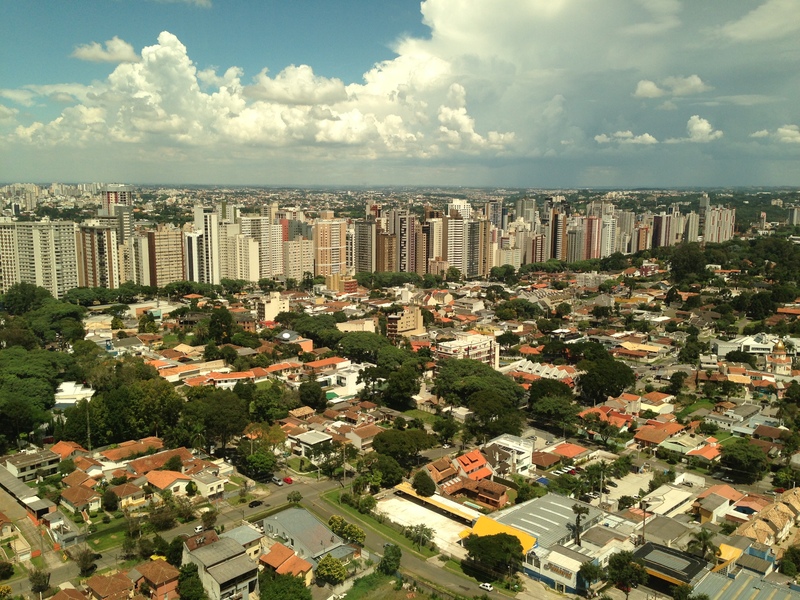 Urban planning has made Curitiba one of Brazil’s most efficient cities. Urban planner, Alfred Agache produced Curitiba’s first city plan, which was executed in part, but never fully completed. The streets have dedicated bus lanes and bus stops are often tubes (tubos) scattered throughout the city. Riders pay one bus fare no matter how far they are traveling. 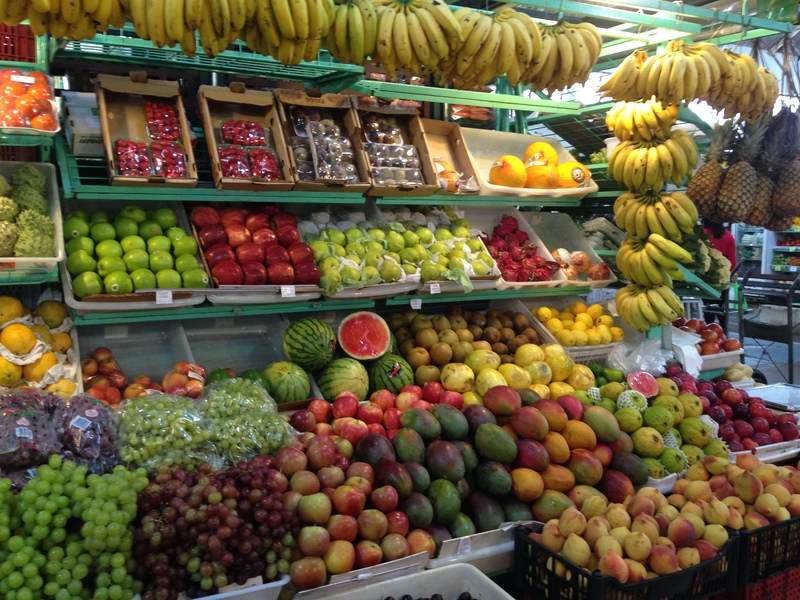 On my first full day in Curitiba, I went to the Mercado Municipal. It’s not quite as huge and bustling as the one in São Paulo, but still has rows of vendors selling fresh fruits and vegetables, meats and cheeses. 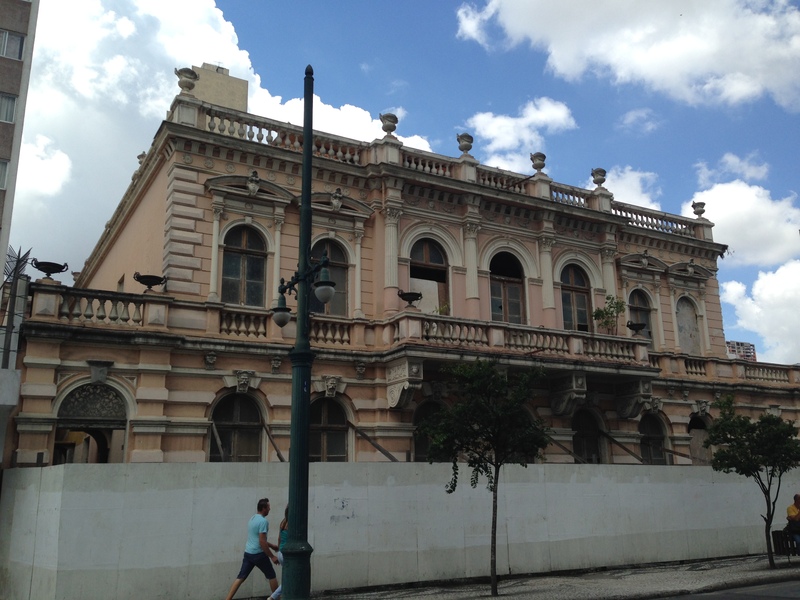 From there, I made my way down Avenida Visconde de Guarapuava and then made a right down Rua Barão do Rio Branco where Curitiba’s notable architecture began to unfold before my eyes. The street has several buildings in various styles and states of restoration. I followed the street all the way to the pedestrian shopping street Rua XV de Novembro, also known as the Rua das Flores, closed off to traffic thanks to urban planning. The street is typically filled with people and lined with beautiful historic buildings. 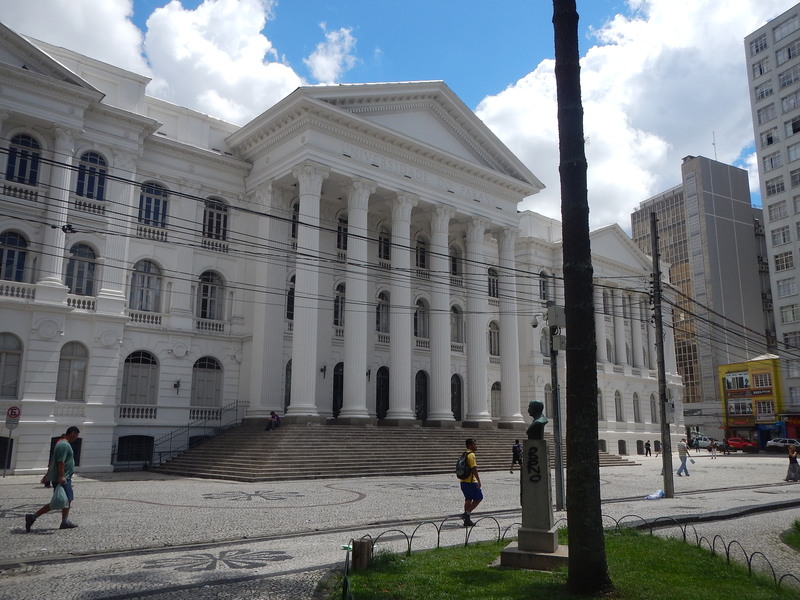 I wandered to the eastern edge of the street, which empties out at the Praca Santos Andrade, and the white neoclassical building housing the headquarters of the Federal University of Paraná, the oldest university in Brazil (although other types of institutions of higher learning preceded it). 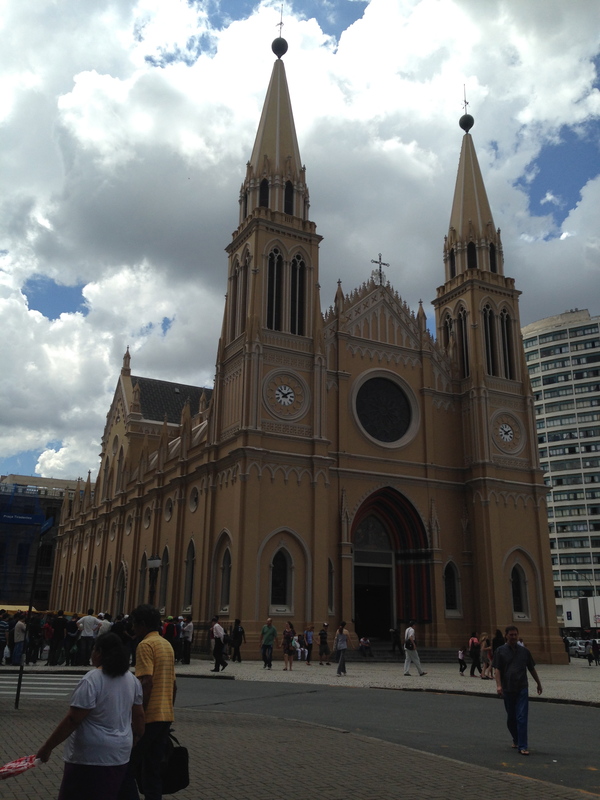 From the Praça Santos Andrade, I walked back through the Rua das Flores to the Praça Tiradentes near which stands the Metropolitan Cathedral of Curitiba also known as the Catedral Basílica Menor Nossa Senhora da Luz. The neogothic cathedral was built between 1876 and 1893, modeled after Barcelona Cathedral. 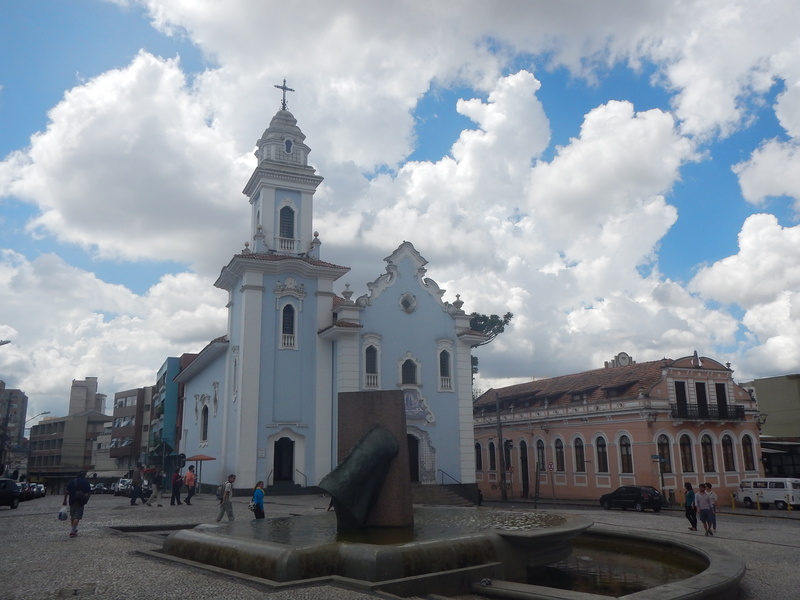 Around the back of the Cathedral is the Largo do Ordem, the site of several historic buildings and the place where Curitiba was founded. After exploring the Largo do Ordem, I decided to hop on the Curitiba tourist bus (Linha Turismo), which takes you to some of the more far-flung sites. With the Linha Turismo ticket, you can hop off and back on the bus and four times and the tickets can be used on any day the bus runs (Tuesday through Sunday). The full circuit takes at least two hours to complete, so you should take note of the bus schedule and when the last bus leaves your location. To get the best value out of the bus pass, it pays to figure out which attractions you want to visit in advance and spend the entire day making the trip. Below are some of the stops on the bus tour that I visited while I was in Curitiba. 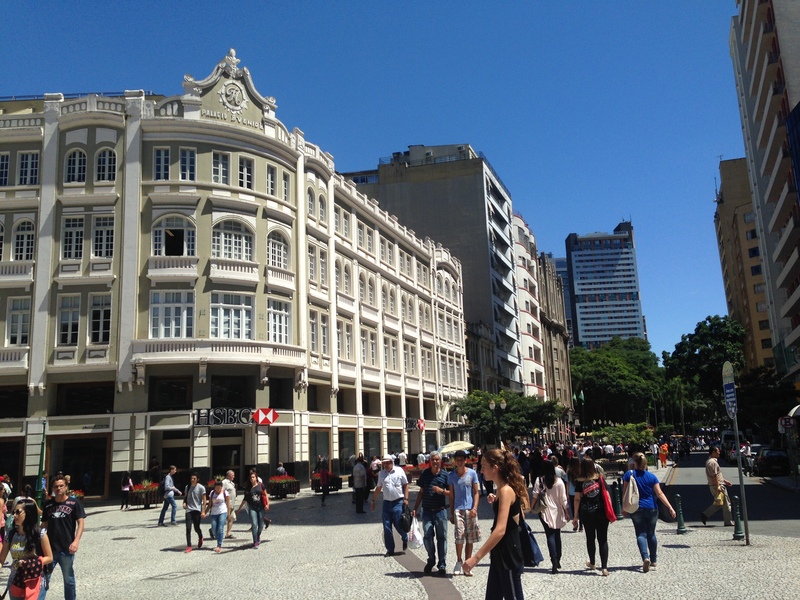 The bus also makes stops at Praça Tiradentes and the Mercado Municipal (described above). The Museu Oscar Niemeyer, designed by its eponymous architect, is spectacular and futuristic from the outside and the inside. A large alien-like eye stares out into the city. 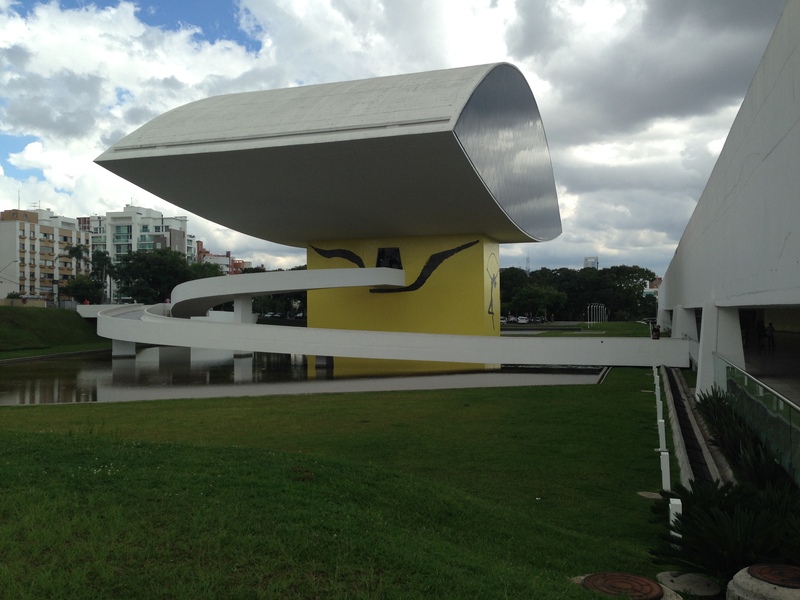 The museum has rotating exhibits of modern art, design and photography as well as a permanent exhibit on Oscar Niemeyer himself. This park was originally two quarries and was going to be turned into a toxic waste dump, but instead it was turned into a beautiful public space in 1996. On the edge of a cliff stands a building with two turrets, fountains, gardens and expansive views. Below the building is green, forested space below and a trail leads to a tunnel, which visitors can pass through on foot or by boat. The tunnel leads to a lake on the other side. 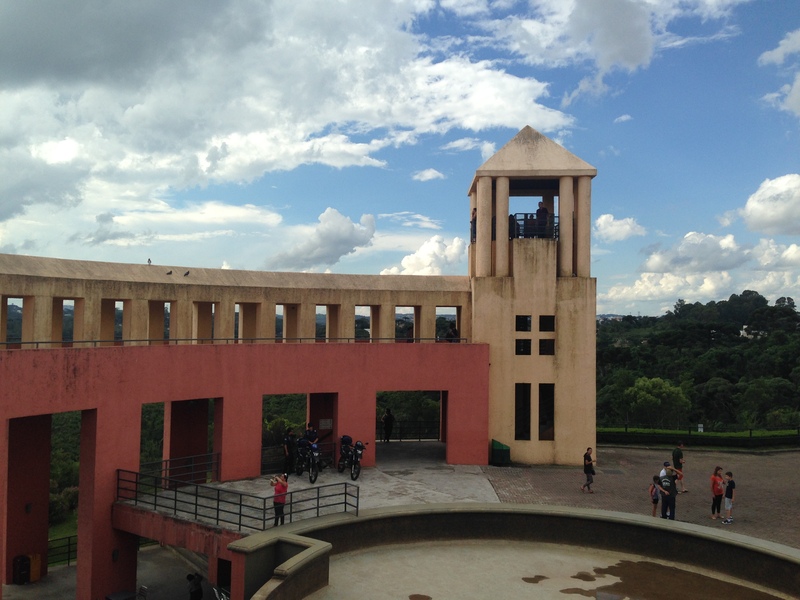 Located to the south of the Mercado Municipal, the city’s botanical gardens are a gently rolling garden space evoking the grandeur of the grounds at Versailles. 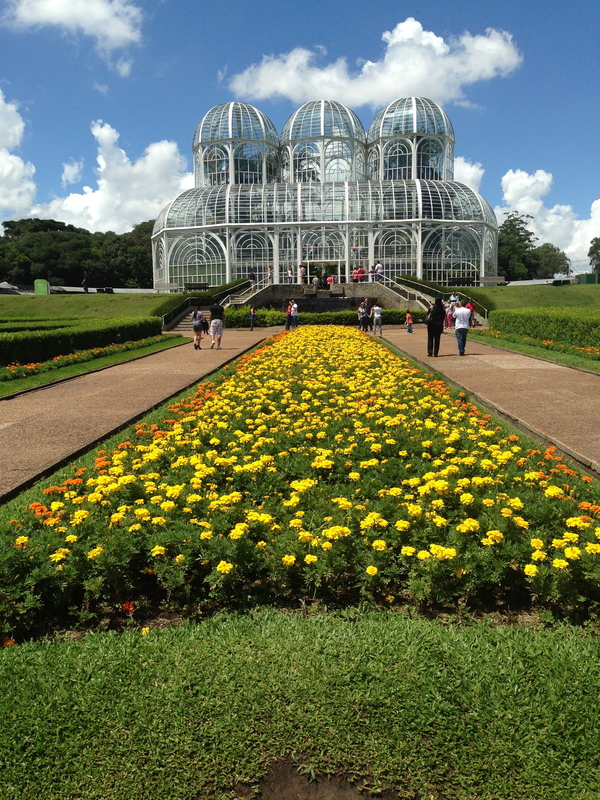 Crowning the gardens is an ornate greenhouse housing various flora of Brazil. 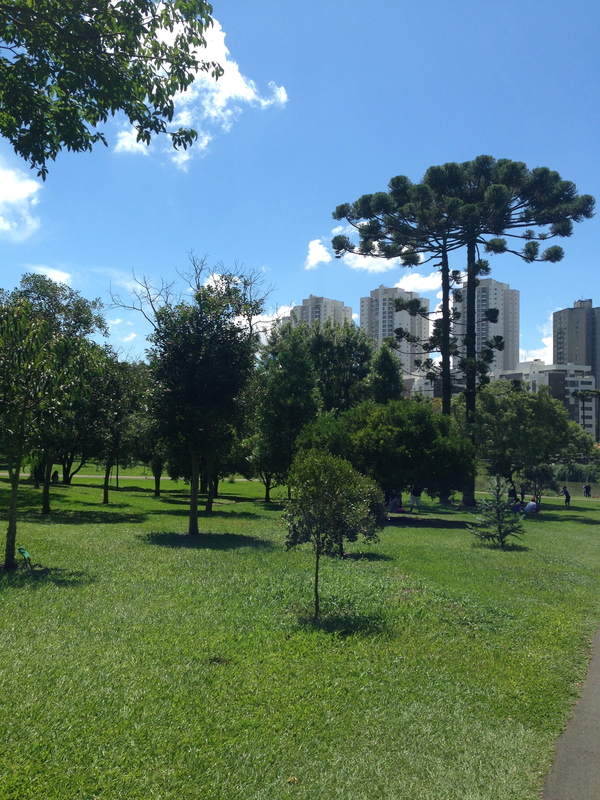 One of my Curitiba friends told me that “Curitiba has no beach, but it has Parque Barigui.” This is one of the largest parks in the city of Curitiba and, especially on weekends, it teems with people exercising, barbecuing or enjoying a stroll. For R$3.50, you can take an elevator to the top of the Oi cellular tower, which offers 360 degree views of the city behind glass. Other notable stops along the Linha Turismo that looked interesting but that I didn’t have time to visit in depth were the Bosque Alemão, Pope’s Woods, Ukranian memorial, Santa Felicidade and the Opera de Arame. My visit to Curitiba was comfortable and enjoyable, especially thanks to my friends there who provided lots of helpful information, hospitality and delicious Brazilian foods. 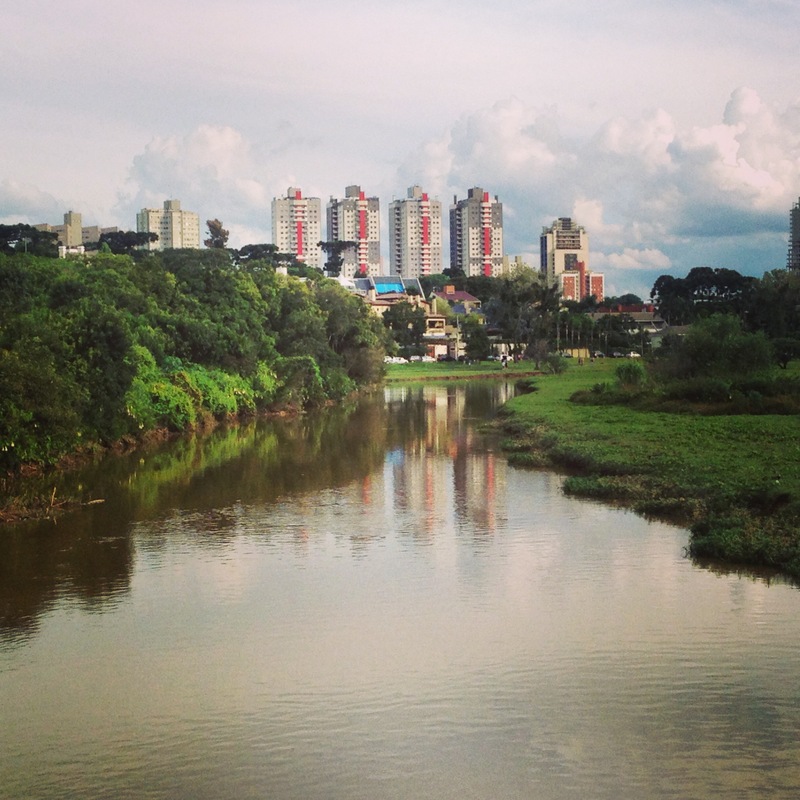 I found Curitiba to feel very safe and secure and was impressed with its overall efficiency as a city. I was pleased to spend a good amount of time in this city and hopefully I’ll make a return trip here while I’m in Brazil.